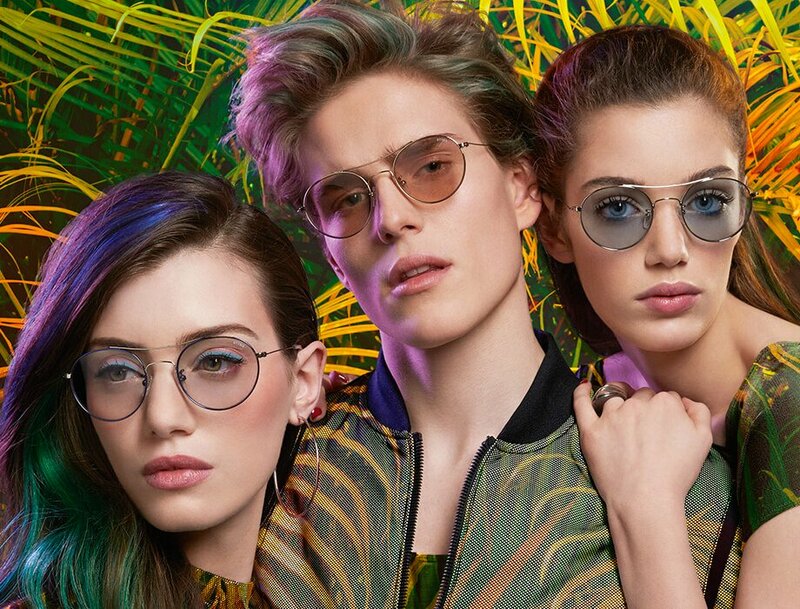 Ocean waves on a golden beach, the iridescent shades of seashells and red hibiscus, the pastel hues of the rainbow and sunset dissolving into starry night: as if on a distant tropical island, the colours of nature explode with energy in the new ST!NG EYEWEAR SS18 collection, releasing all their vibrant energy. The subtle, delicate lines of iconic frames, embellished with high impact geometric details, featuring a fun alternation of solids and hollows in an original contemporary interpretation of vintage forms, make the collection a true passe-partout for fun, personality and unique style. OVER THE RAINBOW – A simil-pilot frame that not only never goes out of fashion but dictates the fashions: these glasses are available in classic and pastel hues, impressed on a fine metal frame – coloured or silver and gold – presenting a double bridge with curved lines making it an elegant, super-cool accessory. SURFING USA – An acetate frame with an over-sized shape, a classic that looks good on him and her alike. Contrasting matt trim, sharp or graduated, depending on the colour, decorates the top line of the frame and enriches its vintage spirit with an unusual modern twist. I GET (A)ROUND – No ordinary round glasses, these frames feature classic elements such as slightly oval shape and a tortoise and black colour scheme, combined with unexpected details such as clear acetate emerging from the upper part of the front piece and the metal core visible inside the temples. PICTURE IN A FRAME – The new ST!NG Eyewear model stands out for its bold, unusual details. Solids and hollows created by clear and solid-coloured acetate surrounded rounded ton sur ton lenses. The exclusive Stars&Stripes variant features an unusual mirror effect with a tiny print. I WALK THE LINE – Definitely outside the box, with plenty of elegance and sophistication, this two-tone style features a metal frame with slender lines drawing the profile of the top mask shape, in the same hue as the lenses. The rods pick up on the colour of the lower part of the frame, while the tips are coordinated with the upper part. STAYIN’ A-LINE – The iconic semi-rectangular shape of this frame is revised to express the true essence of what makes it unusual, with a bridge resting on the upper part of the metal frame to create a geometric line contrasting with the curved shape of the lens. The perfect style for combining elegance and desire to stand out and be noticed. EYE TO THE SKY – ST!NG expresses its creativity once more with an ironic version of an evergreen style. The result is new pilot glasses in fun and attractive colour schemes: a total blue metal frame with tone-on-tone lenses, in a two-tone gold and emerald green version, and, lastly, a version with Stars&Stripes lenses, also featuring the red trim at the ends of the temples. SHINING STAR – These make-up glasses are a true explosion of glitter, for women who are not afraid to show off their femininity with the right dose of irony. An acetate frame with a slight cat-eye shape and contrasting trim on the upper part recalling eye-liner. LIKE A BUTTERFLY – Solids and hollows are back again in the SS18 collection, in a more feminine version. These glasses are made super girlish by a metal mask framing round lenses and elongating their shape, like butterfly wings. Available in a two-tone or a solid-coloured version. AROUND THE WORLD – ST!NG’s rock spirit is expressed once more in a favourite shape, the circle, back in a new version. This super-light frame does not go all the way around the lenses, but is interrupted at the side. The new round frame is available in gold and two-tone versions and with Stars&Stripes lenses.